Asking tribals for a recipe is one of the dumbest things to do. The request is often met with a puzzled look, followed by an answer so brief and off hand that it is over before you even thought it had begun. The strange response probably has to do with the nearly opposite ways in which urbanites and tribals view food. For us, the joy of food means elaborate and creative cooking processes. We try to dish up something new or exotic out of the same old ingredients bought from the market. Tribals, on the other hand, cook most of their food in the same old rudimentary ways, but it never becomes repetitive because nature introduces new foods to their palate throughout the year. Some foods are available for a few months, some for a few weeks and some for a fortnight or less. For tribals, the thrill of food lies in the knowledge and alertness of picking the right food at the right time—when they are available in nature in an edible form. The more their knowledge, the more the variety of foods they can enjoy. Wash the leaves and boil in just sufficient water till soft. Drain out the water. Add either the tamarind or sorrel flowers or buttermilk to the leaves, according to taste. Add a little water and cook till the water is absorbed. Add salt. Serve with rice. 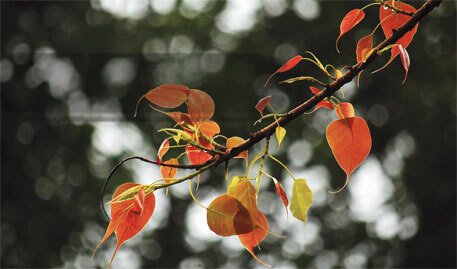 Towards the end of March, when summer is just setting in, tender pink leaves appear on the peepal tree (Ficus religiosa). 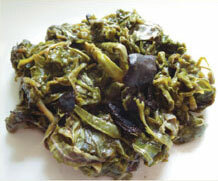 These heart-shaped leaves are a favourite of the Baiga tribe of Mandla and Dindori districts of Madhya Pradesh because they are available for a brief time and add to the variety of the palate, which otherwise becomes monotonous. The leaves are tender enough to cook only for a fortnight, after which they become hard. The tribal women make sure their families get to enjoy several meals of these leaves while they are available. The delicate leaves and leaf buds are known to work as coolants. Consuming five to six meals of peepal leaves during a fortnight is very good because it protects from heat-related problems for the rest of the summer, says Lamtibai Rathuria of Chapwar village, Dindori district. When I asked her to explain the recipe for cooking the leaves, she furrowed her brow and replied, “Khatta daal ke paka lete hain, aur kya? (We cook it with something sour, what else? )” Peepal leaves, bark and fruits are known to have curative and laxative properties in Ayurveda and folk medicine. In Herbs that Heal, H K Bakhru mentions that peepal leaves are used to treat fever, heart diseases, constipation, dysentery, scrofula, mumps and boils. Traditional healer Anantram Shrimali from Sagar district in Madhya Pradesh says that the leaves, bark, roots, fruits and latex of peepal are used to cure as many as 50 different ailments, one of them being sexual debility in both men and women. “Since there is a peepal tree in every village, it is easily accessible to anyone who needs treatment,” Shrimali says. “During the spring season, everyone would pick a tender leaf or two at any time of the day and chew it. It is also known to be good for the teeth,” he adds, recalling his childhood. Thanks a lot for sharing this. I am living in Madhya Pradesh since 1978 and I came to know of this now. I have gone thro the article in the website. It was quite interesting. On the contrary, please let me know the medicinal value of peeple tree ( Ashvata Tree) LEAVES in curing speech related problems and procedure in intake of people tree leaves as I want to administer to my kid who is around 4 yrs. Looking forward for your anticipation.